EDITED: THIS THREAD IS MEANT TO DISCUSS ELEMENTS OF DRESS, NOT TO DISCUSS NEW CATEGORIES. PLAY NICE. IF YOU WANT TO DISCUSS NEW CATEGORIES, START YOUR OWN THREAD. I've become interested in the "Steampunk" genre for literature and for SASS costuming. I'm trying to put together an outfit, but it needs to be something that will work for a fat man. I yam what I yam. I've got a couple of bowlers. I've got goggles, Spats on order, Eyeglass magnifiers, compasses, and other odd bits.
. Tex might not think steam punk is "period correct" enough. Careful. Tex might not think steam punk is "period correct" enough. Cheers...and good luck on your Steampunk outfit...I'm kind of a gearhead...but think I'll steer clear of that dress style. Lilly B. Haven pulls that costuming off well. That sentence might have been worded better? Since when is "Steampunk" a part of SASS costuming. Sounds more like a different event like Wild Bunch. Are you having an identity crisis? I dunno - it's a nice mental visual . Pictures required once you get there! Keep Calm and Goggles On! Noz, Lilly could pull off wearing a potato sack and look fine. Tex would definitely have an apoplectic fit if you showed up in full steampunk. However, we have to remember that not everyone was a "cowboy", even on the frontier. There were in-town merchants, itinerant trades people, and folks just passin' through on the stage coaches on their way to California, especially in the later part of the century. Bowler hats and suits on men were quite common. Also common were the simple "coolie" outfits worn by press-ganged Chinese who built the railroad lines, Mexican peasant garb (especially in the southwest), and the occasional transplanted member of the British Empire (Brits, Scots, Indians, etc...) wearing whatever clothes they normally wore at "home", including kilts and turbans. If you look closely, you'll see all of these are typical of the late 1800's. And, there's a lot of variety here, from frontier Tom Sawyer (right) to big city M (left). 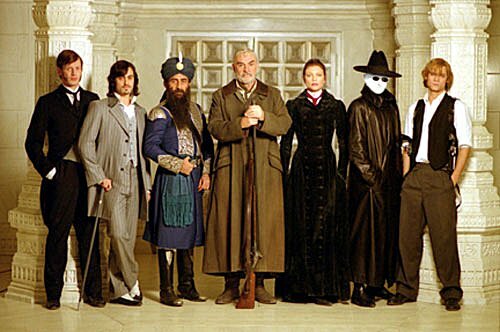 In between you've got a dandy, a Sikh pirate captain, an Africa big game hunter, a fashionable woman, and a guy wearing a full length leather duster. While we may romanticize that everyone in the West before 1900 was a "cowboy", most were not. So, you have some flexibility, under the current rules, to customize your "look". Personally, I'd go with the clothes and leave some of the oddball, steampunk-inspired, accessories (telescopes, welding goggles, magnifiers, gears adorning the clothing, leather shoulder patches with heavy metal decoration, etc...) home. All that paraphernalia just gets in the way on the shooting line, anyway. Anything worth doing is worth overdoing. Moderation is for monks. RAH was absolutely right; as usual. I love the look of Steampunk. Not for me, but for many others it looks great. And some of those that are seriously into the genre are starting to get interested in CAS. Let's face it....Steampunk is really just another fantasy "Hollywood" look. To me it's as viable a view of the "old west" as B-Western is. I don't think you will EVER see Steampunk costuming take over for the other types of costuming at SASS shoots, but I welcome their inclusion and look forward to some new shooters joining our game. Coyoote Calhoun (rest his soul) introduced Steampunk as an acceptable SASS costume a few years ago. I see some outfits every year at EOT. They look pretty good. I don't think it will be widespread though. 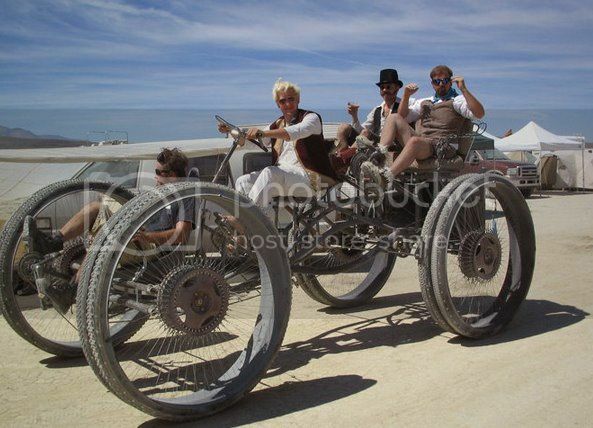 Didn't they do a write up in the Chronicle about Steampunk? If they did...if my memory is correct...that would pretty much indicate that the "Style" is okay with the WB. The Chronicle just had an article showing someone dressed up as a US Navy medical orderly or somesuch. Someone else was dressed up as a Mayorial candidate, not anything in the outfit suitable for cowboying. Townfolk outfits from the cowboy era are obviously acceptable as both the above mentioned won awards for their "Many Wonderful Costumes Displayed at End of Trail '13"
Unfortunately, too many folks think the only way to dress up is as Cowboy...Lots of neat costumes are not "Cowboy" in nature. 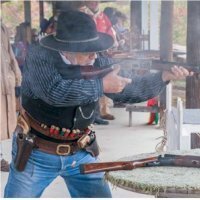 SHooters Handbook - "Cowboy Action Shooting™ is a combination of historical reenactment and Saturday morning at the matinee. Participants may choose the style of costume they wish to wear, but all clothing must be typical of the late 19th century, a B-western movie, or Western television series"
Steampunk doesn't qualify in any way and has no place at a COWBOY action shooting match. I think the name of the game is HAVE SOME FUN, and Steampunk is fun. I think some of it can be worked into a costume, and still be fully within the rules. Ever seen the Television show The Wild Wild West? What about The Adventures of Brisco County, Jr.? We could go way out there and say Firefly...and the League of Extraordinary Gentleman. The Wild Wild West is one of my wife's favorite westerns, and her attraction to Steampunk is what got her to follow me into SASS. Back in May, the Georgia State match had a steampunk theme to it with their adaptation of The Adventures of Brisco County, Jr.
Y'all need to come enjoy the Tennessee State Match here in a few weeks. Theme....The Wild Wild West! Steampunk actually does qualify and does quite well in SASS. I even hear, from a reliable source, that Judge Roy Bean, SASS #1 himself, enjoys steampunk and has ventured there a time or two himself! Wild Wild West is considered one of the Earliest Steampunk examples and, fits nicely into the B-Western category. A number of people at our club dress late 19th Century and look darn fine doing it. I can see why some people are balking at Wranglers and snap front cowboy shirts and the like but lets address these people as individuals, bring out the broad brush and start slapping paint. A Hennepin Crawler gun cart would be cool. LoL! And tomorrow is International Talk like a Pirate Day. I always loved Robert Heinlein. Well, you're entitled to your opinion, but I don't think you're on the rules committee, so you'll understand if I treat it as just that - your opinion. who love the recent cowboy/steampunk crossovers such as Wild Wild West, Brisco County, and the like. feel that we don't need anyone's approval, just tolerance. Given how sacred an issue costuming is to some, I should think this would be manna from heaven . . . If you really feel it is your duty to tell us no, that's an issue you need to look inside about, and find guidance in resolving. For me - it's goggle on - and full steam ahead! A Townie would qualify well in Classic Cowboy. We may be on to something here. Especially with Brass Gripframes on our pistols. Well I think steam punk is very cool looking and will bring something fresh to the game. This is my opinion but I would like a clear ruling if its legal or not !! That is before I spend sevvvveral hundred dollars on my wife. She saw this last night and loves the look. And if it gets her to shooting regular than guess what , I'm all for it !!! Plus I think me dressed in steam punk would have a rather good look with my gold plated Marlin !! !